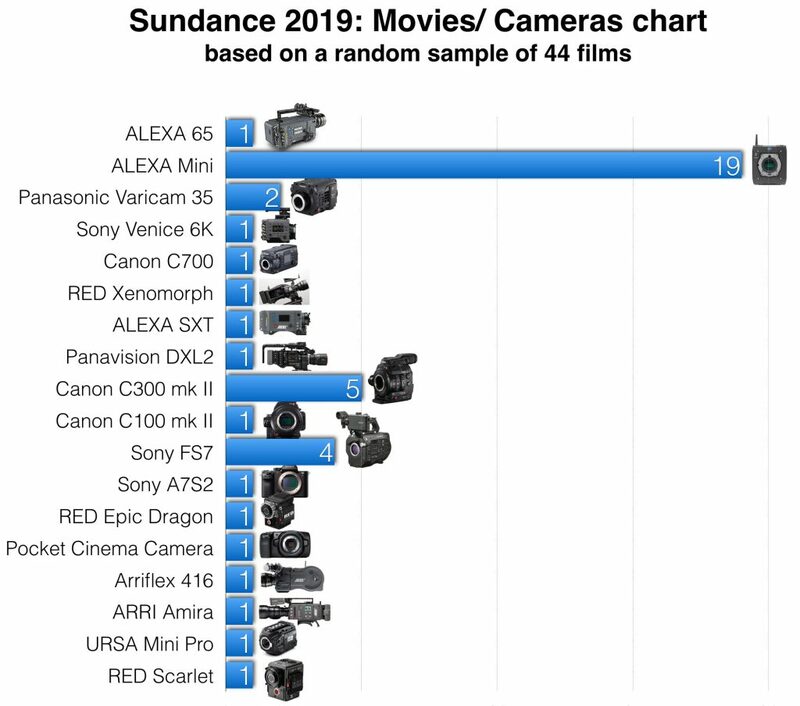 ALEXA Mini is the Dominant Camera Behind Sundance 2019 Films. It appears that the ALEXA Mini did it again. Being the most desired camera by filmmakers at almost every prestige festival or contest, ALEXA Mini was chosen again and again by filmmakers as their weapon of choice. What is the logic behind that? Why not using RED? An enigma that is far from being solved. We chose a random list of 44 Sundance 2019 films in order to explore the main cameras behind them. 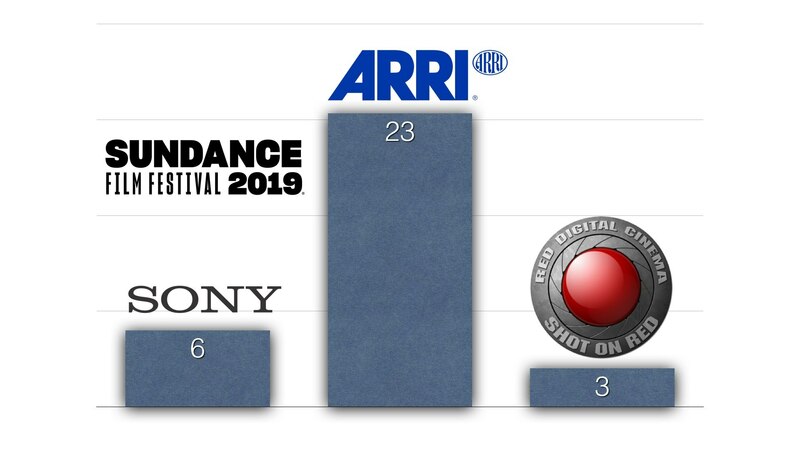 Based on that, we created a chart that shows the data regarding cameras and Sundance movies. We were astonished by the results. ALEXA Mini was by far the most preferred camera on filmmakers with 19 films that were shot on ALEXA Mini and four more that were shot on other ALEXA cameras (ALEXA 65, SXT and Arriflex 416). What is the reason for that? I guess we will not get a defined answer. From the other hand, RED is lagging behind with only three cameras to be used (Xenomorph, Epic and Scarlet). No Monstro nor Helium (taking into consideration the Gemini was a new model for the time of making those films). So what the hell is going on? Why is no RED? ”First, keep in mind that RED cameras are used by every major studio, a great deal of broadcast content, every streaming service, commercials, in submersibles, Panavision, nearly every rental house (even Arri Rental, hell I’ve rented from them), NASA, SpaceX, the Military, etc…. A whole lot of camera bodies out there filming all sorts of stuff at every budget level and for pretty much every type of outlet. The industry is massively dynamic, but RED has been broadly accepted industry-wide for some time now while pushing the industry forward in a few ways…bare in mind you can get an Alexa for the low end of $$,$$$ purchased used these days and rentals are on the less expansive side of things, I’ve seen Mini rentals going below 1/2 market rate at this point, which is fine as many productions get decent deals on gear especially for longer shoots. Same likely for all the cameras used on a variety of these festival productions…I enjoy the jabs here and there and the knocks on reliability, but keep a solid head on your shoulders, RED cameras are in space and it takes a great deal to even get to that point for how they are being used way up there. Back on Earth, I’ve used them in piss freezing cold and torturous hot temperatures and staked my livelihood on them performing in those conditions. I’m certain you’ve seen some of the Collective pieces and you can see that these cameras are being used well outside of the safe confines of an air-conditioned sound stage. Are RED’s shooters different from ARRI shooters? There is no doubt that RED cameras are pushing the technology forward and are being used on major films. Somehow, those cameras were failed to conquer the stages of the festivals (including the Oscar). In my opinion, this is less about the camera and more about the filmmakers that use it. If we aim for a mathematical assumption, could it be concluded that filmmakers who use ARRI are more artistic than others?